The Irish love their horses – and we love how they celebrate that love in jewelry! Ireland has a long, complex relationship with horses that goes back to the dawn of time. Before Christianity became the dominant religion in the region, the Celtic people worshiped a variety of Gods and Goddesses. Among these was Epona, a goddess of fertility and protector of horses, donkeys, and mules. Epona was the only Celtic goddess who made it to Rome, where she was worshiped extensively. You can still see examples of her in Roman sculpture of the time. Perhaps the most well known and distinctive form of Celtic decoration is knotwork, in which endless loops and knots repeat to create distinctive patterns. Examples of this artwork have been found dating back to the fifth century and are still being made today — proof positive that good design never goes out of style. Lovers of Celtic knotwork are drawn to the intricate pattern, the complexity of the craftsmanship, and often, the animal motifs that are woven into the knots. Particularly common are those two perennial Irish favorites: dogs and horses. In the late 19th and early 20th centuries — the time when many writers, especially William Butler Yeats, were doing their best work, there was a great passion for everything Irish. This was termed the Celtic Revival and many people embraced it as a rejection of a life they felt was too modern and out of control. Here we are, two centuries on, and the pressures of modern life are still with us. Perhaps that’s why the timeless, mysterious — some even say mystical — feel of Celtic knotwork horse jewelry remains. 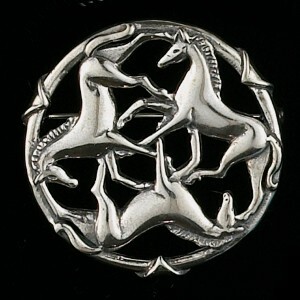 This Sterling Silver Celtic Horse pin is a particular favorite of ours. At 1 and 3/8 inch in diameter, this round pin uses a traditional image of Epona, repeated three times in traditional Celtic Knotwork fashion. Appropriate for every setting, evocative of Ireland’s verdant shores, and perfect for the horse lover, this pin makes a great gift for someone special — or for yourself! This is absolutely stunning!!!!! And to me, as a horse- person (it was my first word…I was the ONLY horse person born into a non-horse family…I bought/trained and supported my first at age 11…that’s lots of stall cleaning/babysitting/lawn mowing etc lol!) it also expresses the togetherness – balance if you will of horse interaction.